Beyond Maidan and Kyiv, there have been confrontations between the people and the regime for a long time now. Euromaidan activists in the country’s regions (“oblasts”) have been trying to expose to residents that a corrupt regime is governing the country, one that has brought it to the edge of bankruptcy. The regime has resorted to an information war, it has put economic pressure on businesses supporting Maidan, it has brought up criminal charges against activists, and it has threatened their families. There has been pressure put on civic organizations that have supported the Maidan. In Donetsk, the editors of the online news portal, Novosti Donbasa, and the Center for Political Studies at Donetsk National University, have been victims of this pressure. Personnel from both institutions have been thrown out of their offices onto the street, with no explanation given. “I called the owner of the building, and he said that the manager had made the decision,” said Oleksiy Matsuka, editor-in-chief of Novosti Donbasa. “I called the manager, and he said that the owner had made the decision.” Besides supporting Euromaidan, this publication often features events that are inconvenient for the regime. In Crimea, the Euromaidan Crimea Forum was refused access to the building it rents, even though a contract had already been signed and rent had already been paid. Three hundred forum participants conducted their meeting right on the street, in front of the offices of the President’s Representative in Crimea. All over Ukraine, people are leaving the Party of Regions. There has been no mass exit from the party so far, but the number of those making this deliberate choice is growing day by day. It is also worth pointing out that a majority of such people are not mere rank-and-file party members, so their leaving the party is rather significant. For example, on February 7, in Transcarpathia, Andriy Stryzhniak, the son of the former head of the Constitutional Court and a member of the Transcarpathian Regional Council, left the council’s Party of Regions faction. People’s self-defense brigades, similar to those in Kyiv, have already been set up in ten oblasts. According to UDAR, brigade members are being recruited in Vinnytsia, Ivano-Frankivsk, Lutsk, Lviv, Odessa, Poltava, Rivne, Ternopil, Uzhhorod, and Chernivtsi oblasts. Members of local communities, various opposition political forces, and civic organizations are joining these new brigades. According to Anatoliy Musakovskiy, assistant commander of the National Resistance Headquarters, a very diverse range of people are entering these brigades, from ordinary workers to professors and law enforcement agents. Women are asking to be included in self-defense forces as well. The main task of these brigades is finding provocateurs and keeping order during public meetings and protests. LIGABiznesinform reports that the Ministry of Internal Affairs (MVS) of Ukraine has claimed that these organizations are nothing other than organized crime groups. This past weekend Euromaidan activists conducted a protest march in Sumy, picketed Channel Seven in Kharkiv and in Luhansk, and met with supporting UDAR activists repressed by the regime. In Zhytomyr Oblast, activists drove to the Governor’s residence to investigate how he manages to live there on his official state employee salary, and picketed his estate. Several dozen militia met them. In Odesa, activists picketed the Russian General Consulate and conveyed a request to the Consul to keep Yanukovych, who has gone to Russia for the opening of the Olympic Games, in Russia. On the other hand, they asked him to help release “fighters against the regime,” namely Russian political prisoners arrested in May 2012 during the “March of Millions” in Moscow. In Ivano-Frankivsk, protesters went to picket the building of the District Administrative Court judge, but they had the wrong address. A woman claiming to be the judge’s former wife came out to the protesters and said that he has a new wife, and that he has been living at another suburban mansion for a long time. Activists in Chernivtsi and Chernihiv have called on people to boycott businesses that belong to Party of Regions members. 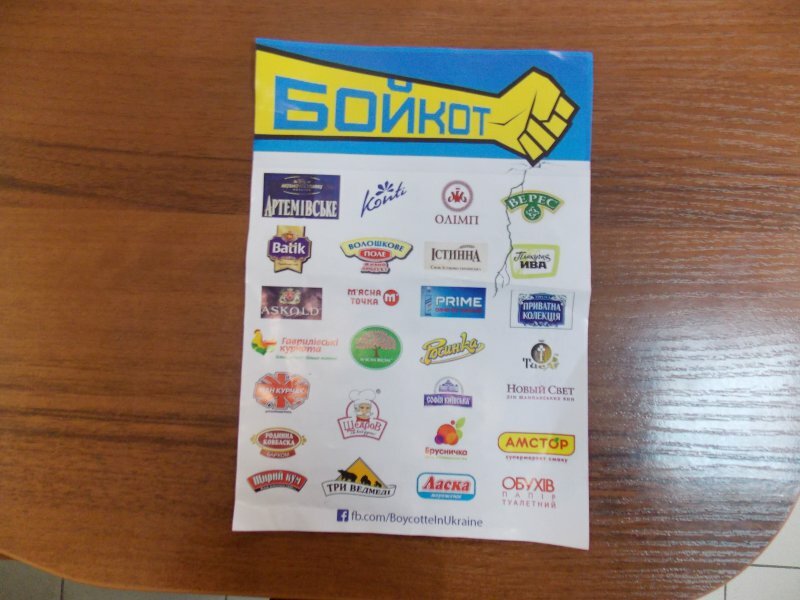 In Chernivtsi, they put leaflets in mailboxes, calling for the boycott of brands belonging to party members. 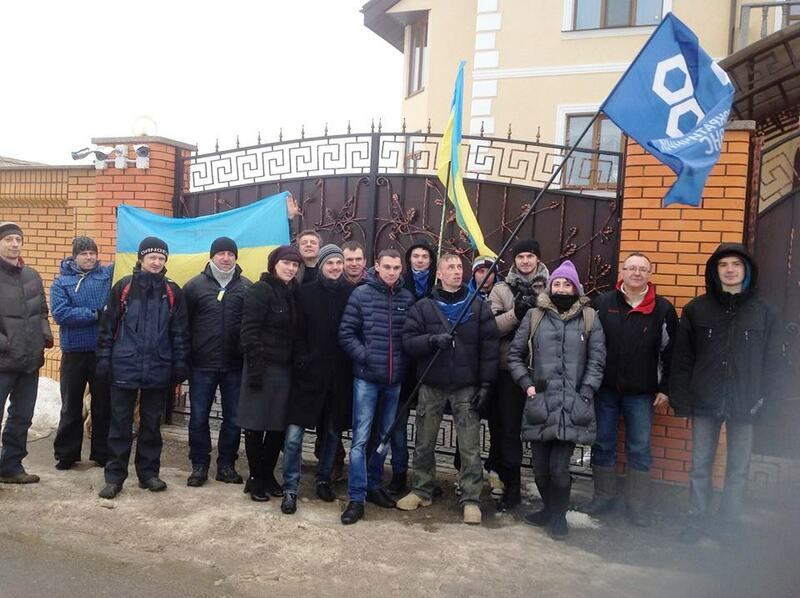 In Chernihiv, the Democratic Alliance Party came up with a boycott plan. The party distributes information about local business belonging to Party of Regions members, and explains to residents why an economic boycott is effective and is needed to bring about Yanukovych’s resignation. In Lviv, a struggle is also taking place on the cultural front. The Dzyga art association has organized meetings with Galician cultural studies experts, writers, and artists for the “Euromaidan and Culture” project. During these meetings, people can meet with artists and hear their comments on events taking place in Ukraine. Iuriy Kucheriaviy, project coordinator, promised that these meetings will take place as long as confrontations between society and the regime last. Artistic events are not just taking place in Lviv. In downtown Donetsk, activists brought in a blue-and-yellow piano. Piano concerts took place on Monday, February 10, in Donetsk, Zhytomyr, Zaporizhzhia, Kyiv, Rivne, Uzhhorod, Kharkiv, Cherkasy, and Kirovohrad. In Kirovohrad, a contest was announced for the most creative revolutionary poster used in Euromaidan events; most importantly, people were encouraged to bring new posters to Kirov Square. So the country’s various regions are, indeed, participating in Euromaidan – the revolutionary spirit lives there, too. The problem is simply that part of what happens in the regions receives no coverage, due to a lack of communication between regional and national publications.